Today was beautiful outside, so we went for a walk. We stopped to play with fallen cherry tree blossoms and admired other flowers in neighborhood yards. At one spot, there was a thick patch of pretty little purple flowers and both kids bent down to smell them. Then Jonah says, "Look mom, they're so pretty - like Elisabeth." I agreed. After returning home, Elisabeth choked on some snacks while they were playing (I thought they were done with the snacks). 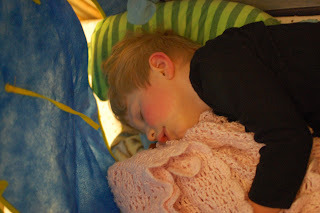 A little bit later, after I had put Elisabeth down for a nap, Jonah asks, "Will Elisabeth be alright mommy?" I assured him that she was fine now. It is so nice to see him appreciate and show concern for his little sister. 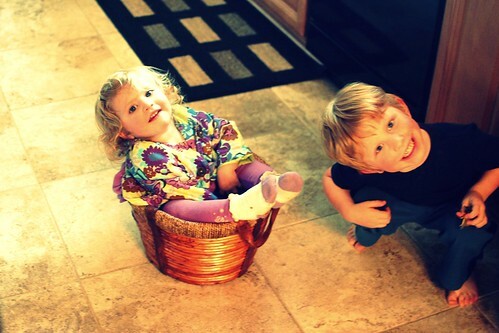 What a good big brother. Sharks and Snakes and Frogs, Oh My! 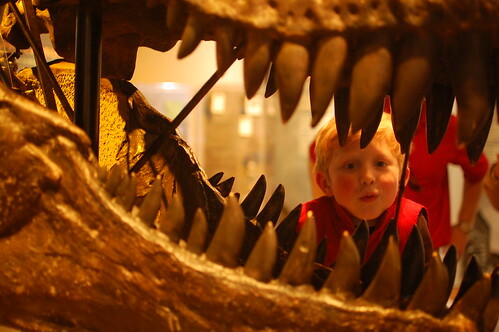 We haven't been to the North Carolina Museum of Natural History in quite some time until this month - we went twice. We went with some friends and their daughter to check out the Megalodon Exhibit. We thought Jonah would love it, but the big shark models hanging from the ceiling and the dark lighting kind of freaked him out. 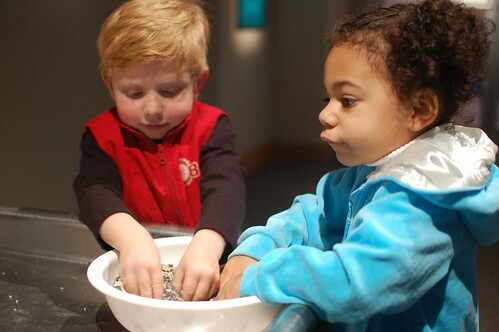 His favorite thing that day was playing with all the little miniature aquatic animals in the "hands on" learning center. 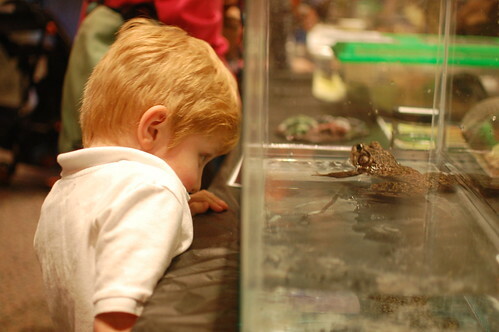 We went back the very next Saturday because Jonah's preschool teacher told me about Reptile and Amphibian day. 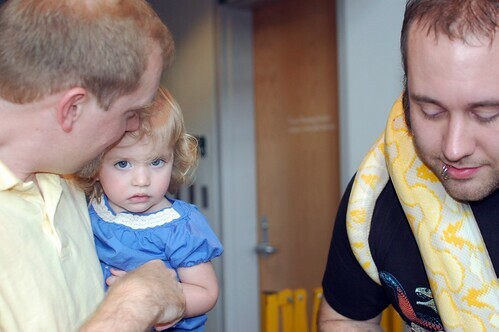 On this trip, Jonah got to "pet" some snakes. I made sure I was behind the camera for the snake petting. My favorite pictures from those two visits are below, followed by a link to many more. In case you are interested, here is the schedule of upcoming events at the museum. DSC_9819a, originally uploaded by planetdavis23. DSC_9653a, originally uploaded by planetdavis23. I love this picture and thought others might appreciate it. 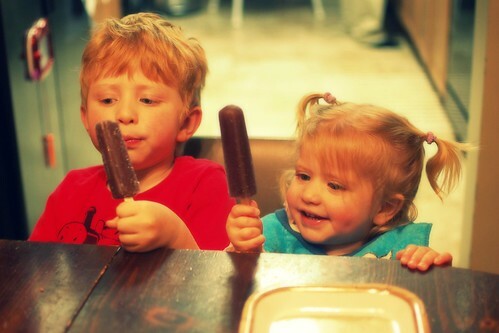 It is a great picture of both kids enjoying something together. I love the look on Elisabeth's face. This also happens to be the first time I had ever put her hair up in pig tails. 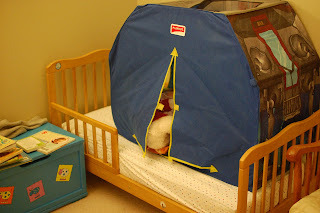 I got Jonah a Star Wars or rather Clone Wars playtent for Valentine's day. He loved it as did Elisabeth. They played with it in the living room for a couple of days. It wasn't long though before it ended up as an accessory on Jonah's bed. This didn't surprise me considering he would drive us crazy about attaching a sheet over his bed which kept falling down. So this has turned out to be a good thing for all of us. As you can see he feels right at home in it. I have a poinsettia plant that has suffered greatly since Christmas; it has maybe 4 of it's red leaves left. (The red part of poinsettia's are actually not petals of a flower but red bracts or leaves - one of those little tidbits I learned in Botony class in college.) Jonah has occasionally given the diminishing plant notice. Today, I threw out my cut Tulips as they were drooping terribly. In the process, I dropped several orange petals on the floor. Jonah collected a few and asked to keep them. Then he compared them to the few red leaves on the dreary poinsettia and said he like the poinsettia better. I kind of interpreted that to mean he preferred the color red over orange, but I'm not sure. He then takes the petals and puts them on the toy work bench in his room and then asks if he can have the poinsettia too. I asked him if we wanted to take care of the plant and if he could do a better job than mommy. He didn't answer as he didn't really know what I meant. He then took it into his room and added it to his workbench next to the tulip petals. I told him that he needs to take care of it and give it water. Then he says, "And apple juice." I said, "No, just water." Then he says, "And milk." Again I said, "No, just water." I think we went back and forth a couple of times like this until I restated things as clearly as I could, "Milk and Apple juice could hurt the plant. Jonah can have milk and apple juice, but the plant just wants water." He then pressed me to give it water, as I was busy cleaning up the kitchen. I finally got around to it at bedtime. (thus it's current state). I did notice that it has a couple of new leaves, though. Perhaps Jonah's interest will help it endure a bit longer. I have determined that for every child one has the risk of getting sick increases exponentially. When it was just Jonah, he rarely got sick. Now we have Elisabeth and Jonah is in preschool. Risk of picking up sickness has increased exponentially. Elisabeth picked up some kind of bug over the weekend which led to vomiting and then some diarrhea. She seemed to be getting back to normal Sunday evening and Monday morning I thought we had dodged a bullet. Then Monday after Preschool, Jonah got sick and by the afternoon it was my turn and then late into the night it was the husbands turn. We're still not back to normal yet, but the worst is over. Thank God! DSC_9213, originally uploaded by planetdavis23. This is what happens when you let Jonah pick out his pajamas. 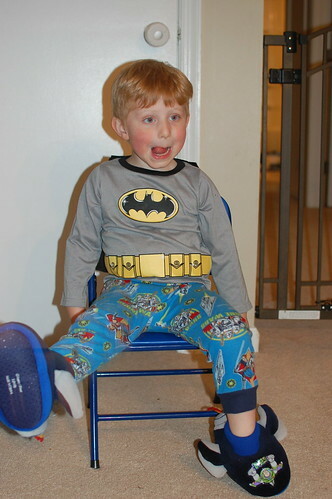 Batman shirt (cape included), Star Wars pants, and Toy Story house slippers. (Note: I pulled this picture up on my computer to blog about it and Jonah sees it over my shoulder and gets all excited - "can I put that on mommy?") There is no accounting for taste especially for 3 year old boys. I hope I don't stifle his unique tastes too much when he's older. I have gotten braver about trying new recipes over the last few years. It has been so cold this winter that I have been inspired to try to make soup for the first time ever. I met with success when it came to the Spicy Pinto Bean soup, but this one for a Chickpea soup just didn't turn out. The picture looked good and since I like hummus I thought I'd give it a try. 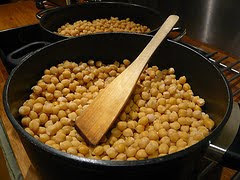 The first time I tried this recipe I overcooked the chickpea's or so I thought. Once I pureed the cooked chickpeas, garlic and onion as stated in the recipe it tasted blah. That was a few weeks ago. So I tried again last week and used my crock pot to cook them. Well again, I pureed a big batch of the stuff and again it was just blah. My husband ate a couple of bowls of it after dumping some salsa and cheese on top of it, which is what he does with anything he is tired of or doesn't like. That does not seem very appetizing to me so, I thought I would ask for ideas from others. I have a big batch of this stuff in my freezer. I don't know if I just need to add a ton more garlic or if there is some other things I could add to this. Or perhaps, I could go a totally different way and use this as part of a recipe for something else. I just haven't used chickpeas much in cooking. So if you have any thoughts on how this could be utilized, leave a comment. Otherwise, I'll just toss it. Luckily, dried chickpeas are pretty cheap. 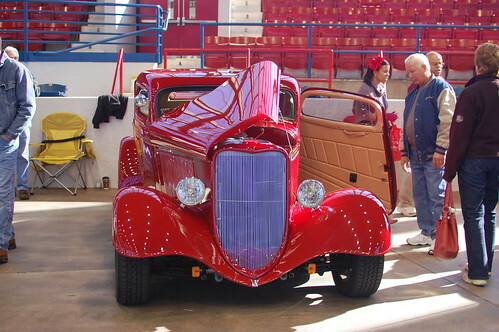 Every year there is an auto show in town and somehow we have managed to attend a handful of times in the last decade. Just one of those things that Kelly and I enjoy doing together and have found it easy enough to take the kids as well. Like most people, we identify and evaluate cars based on our "dream car" category and the vehicles that would best meet our current needs and desires. Interestingly, my tastes are much less luxurious these days having small children. More on that in a moment, but I thought I would share my top picks from this years car show. We've always like this vehicle, but it's interior space isn't really any bigger than our Hyundai Santa Fe. I like this one because it's comparable in interior space with what we have but perhaps a bit bigger cargo area that includes 3rd Row seats. 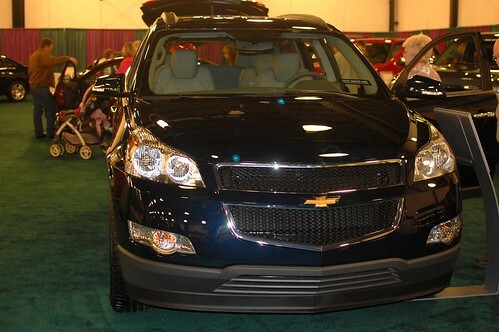 The thing that I loved about this vehicle is that you have all the space of a minivan, without the minivan look or feel. In fact, it would be my #1 pick, except for it's minivan price tag. Interestingly, I didn't take any pictures of this one. I suppose that is because I already knew we liked it. We test drove one in 2006 when we were expecting our first baby. It was roomy and my husband's eyes lit up when he drove it. You know that look men get when they like what they're driving. It handled much like his sporty Honda Civic which we were selling in order to get something more family friendly. This Mazda is supposed to be a minivan, but it's smaller and has a sportier feel. It is also more economical than most minivans. 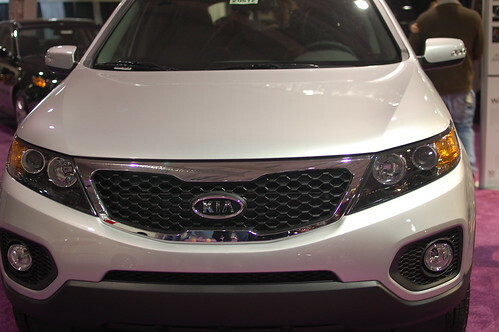 The main reason this car is my #1 pick from the auto show is because it's the most attainable for us. Not a new one so much as a used one. Here is a good review compliments of automoblog. I have had the good fortune to have owned 3 new cars in my lifetime (although the second was to replace the first after it was totaled in an accident.) As a result, I was rather spoiled to the supposed reliability of new cars and the warranty you get when you buy new. 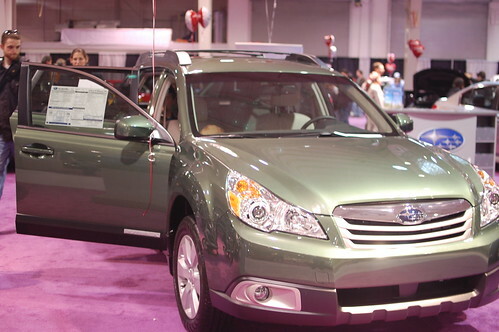 When we bought our 2002 Santa Fe in 2006 it was only the second "pre-owned car" I had ever actually purchased, but not the first I had ever owned. My first car given to me by my parents was a 1983 Pontiac TransAM with T-tops much like the one seen here: My prejudice toward new cars has changed though since having kids. I am so glad we bought our car used. Not only because of the financial reasons, but also because I would be so stressed out every time a diaper overflowed or the kids dropped food in the car or my drink splashed around. Then there was that incident with the Harris Teeter shopping cart - there is still a dent but at least the green is gone. Oh and I forgot about the ladder in the garage - again not a huge deal, but if it had been a new car it would have been. God really blessed us with this car. It has been good to us and hasn't needed much attention. Praise God! May all of our cars be as reliable. I don't know if I really have a dream car. But if I was a movie star and had a car guy to take care of it, this is what I would want to pull up to the red carpet in wearing my red velvet dress, diamonds, 30's retro hair, and a white fur stole. 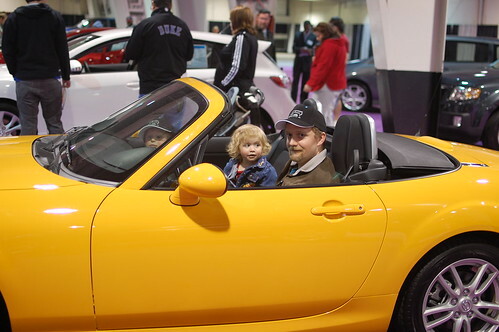 Here are all of our pictures from Raleigh's 2010 International Auto Show.